Principal Cast : Sam Rockwell, (Voice of) Kevin Spacey, Dominique McElligot, Kaya Scodelario, Benedict Wong, Matt Berry, Robin Chalk (as body double). Synopsis: Working alone on a base on the moon, Lunar Industries employee Sam Bell is coming to the end of his 3 year contract. However, when he starts having headaches and hallucinations, he uncovers a secret that will turn his world upside down. What we think : Awesome science-fiction film from debut director Duncan Jones, featuring a mesmerizing performance from Sam Rockwell, Moon is essential viewing for anybody who enjoys or appreciates well crafted film-making. This is an astoundingly good film, vastly underrated, and wholly captivating. My good buddy across at Above The Line, Rory Dean, prompted me into giving Duncan Jones’s work a look-over after reviewing Jones’s action genre entry, Source Code, and although at the time I write this article (mid-August 2011) Source Code is unavailable on BluRay to peruse, I did trot down to the video store and pick up a copy of Moon to get me started. Boy, am I glad I did. I’d heard good reports about Moon (in response, though, I had also heard bad reports, specifically from The Secret Squirrel, who sent me an email to say he/she’d fallen asleep watching it) and while I was keen to see it, other films had drawn my attention away from giving it a shot. Having now seen it, I’m prepared to offer a mea culpa of sorts to Jones for not appreciating his magnificent talent until now. 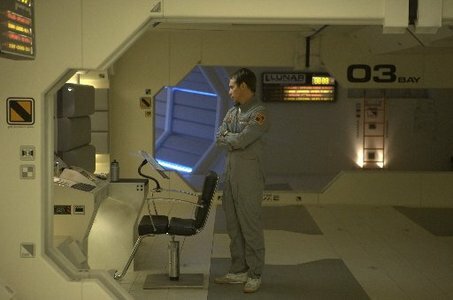 Moon is not a film you can watch lightly: it requires concentration and understanding; understanding for the character-driven story it unleashes, and concentration in trying to connect the dots and follow the twists and turns. Long-time cinema junkies may spot the “twists” coming a mile off, and I admit, both my wife and I spotted it a fair way from the end (it’s not the point of the film to have a twist, but merely a plot deviation which makes the scenario even more heartbreaking), but it did nothing to lessen my enjoyment of Duncan Jones’s debut effort. 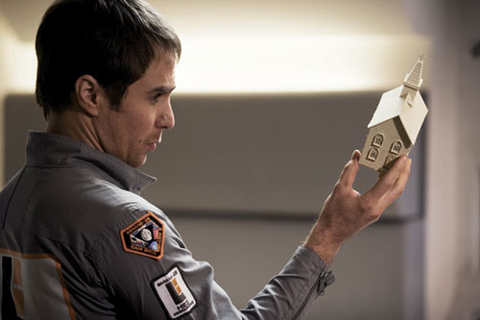 Sam Bell (Sam Rockwell) is an employee of Lunar Industries, a company that’s found a way to harvest a new power source for Earth on the moon, and ship it back to civilization. The company has established a base on the moon, and sent a single man, in this case Bell, to operate it. He’s essentially a maintenance monkey, reporting on a daily basis for back to the company HQ on how the harvesting is going. With two weeks to go before his 3-year contract is up, and he can get back to his wife (Dominique McElligot) and young daughter Eve (Kaya Scodelerio), Bell starts to notice things happening which don’t quite jibe. He gets headaches, he’s having visions, and his messages from Earth appear to have been tampered with. After a particularly eerie vision, Sam goes out in a moon buggy to fix a problem and crashes the craft, knocking himself out. Waking up sometime later back on the base, he’s comforted by the resident AI computer GERTY (voice of Kevin Spacey) and informed that a recuse craft has been sent from Earth to help repair the damaged harvester. Sam soon finds that he’s not alone back at the base, with a man also claiming to be Sam Bell walking around. As I watched Moon, I felt echoes of Kubrick’s 2001: A Space Odyssey and Tarkovsky’s 70’s slow-burn Solaris, and the subtle camerawork and hallucinogenic qualities Moon carries with it plants it firmly in that genre of realistic science fiction. This is less Star Wars and more hard sci-fi, the complete antithesis to Michael Bay and George Lucas (although, come to think of it, Lucas’s own THX1138 was framed in a realism similar to this) and a genuine attempt to foresee some sort of utopian future still dominated by the corporate culture. 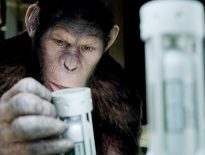 Duncan Jones wrote the script, along with Nathan Parker, and according to the interviews on the BluRay I watched, Jones wrote this film specifically as a vehicle for Rockwell, an actor Jones had wanted to work with for some time. Rockwell does a solid job here, carrying this film in both the role of Sam, and the equally important role of Sam as well. I’m loathe to give away the specific plot point which spawns the majority of the narrative thrust, so lets’ just say that for a long period in this film, he’s acting with himself. The why’s and hows, you’ll have to find out for yourself. I asked for a house and you sent me this? Moon’s a cerebral effort, and a quality one at that. Jones gives Sam a sense of purpose in his quest to complete his contract, the same kind of fingernails-on-the-cliff scraping along we all do when the end is so close, and yet still so far away. The world we’re entering into seems to be wholly corporate, the sheep-herd mentality that proliferated a lot of the 70’s and 80’s sci-fi (see Weyland-Yutani in the Alien franchise, as an example) when Big Brother took over the world and made us all a number. Lunar Industries, the ubiquitous corporate master of Sam’s isolated and lonely life, is less interested in Sam’s problems than it is in harvesting the highly profitable He3 from the moons surface. This wall of indifference, enhanced by a lack of live communication thanks to a supposed solar flare some time in the past, gives Sam’s character the defeated, downbeat emotional state we meet him with. He’s simply going through the motions of his workload on the moon, biding his time with stoic indifference until his contract expires and he can go home. This lonely character is initially a little hard to penetrate for the viewer, although Rockwell’s charming performance is eloquent enough to allow us an appreciable feeling of concern at his fate. Indeed, when the tables turn and Rockwell must perform as a parallel second version of Sam through the second and third acts of this film, the new character of Sam seems at odds with the older version, and Rockwell handles this slight difference well. Where Moon succeeds is primarily in creating the environment on the moon’s surface, and how Sam interacts with it. Without a convincing inhabitable world for our character to live in, and journey through, the film would be undone by it’s relative lack of budget (supposedly this film came it at around $5 million, which, considering the end result, is an astonishing effort!) and we’d see “the seams”, as it were. Jones puts us right onto the moon, a most alien of worlds (again, perhaps allegorical to the corporate oriented world Sam’s left behind, in that it’s an isolating culture breeding disassociation) and we believe it exists. This inherent believability serves to accentuate Rockwells performance, since he’s essentially alone by himself for the entire film (even if he is acting with himself!) and draws us, the viewer, even further into his plight. Jones’s attention to detail, from creating the full 360 degree set to the model-work for exterior filming, is superb, and I soon discovered that a lot of the shots and sequences I thought were visual effects were actually detailed models and scale-sets. The quality of this work is amazing. I knew I should have remembered to take that defensive driving course! The secondary success is in the layered, revelatory nature of the film itself – this film unwraps itself like a pass-the-parcel at a kids party. 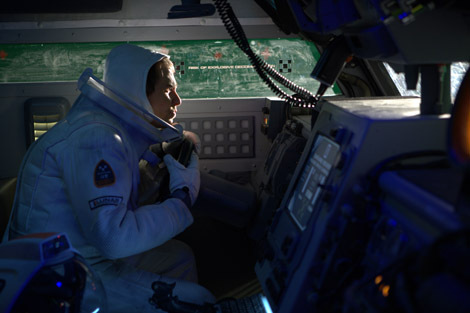 Genre conventions and cliches aside (and there’s a couple strewn throughout the film), Moon feels revelatory for its attempt to make itself more a mystery thriller than an out-and-out sci-fi work, even though it’s set in space and there’s no oxygen outside. 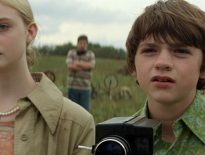 The style Jones presents with Moon is one from the David Fincher school of film-making, in that he reveals little moments of plot and detail which further drive the narrative as the film goes along. It gathers momentum, if you will, thanks to the slow discovery of the bases’s hidden secrets by Sam himself, and our piecing together the riddle of who Sam and his doppelganger are, and why they’re there. While I’ve never been a huge fan of psychological thrillers (a genre which this film supposedly enters itself as) per se, I was really taken with just how nuanced the “meeting oneself” concept traveled in this film. Again, Rockwell is to be commended for his ability to perform on multiple levels here. The film delves into elements of self-perception, of what we think of ourselves and how we’d do reconciling that if we ever actually met ourselves. It’s an interesting concept, and although I don’t think Moon quite captured the fractured nature of this narrative as well as it could have, it’s a solid attempt and a worthwhile effort. Clint Mansell, who scored Darren Aronofsky’s debut effort Pi (and Requiem for A Dream) delivers a knockout score again here, the delicate string and orchestral work of the emotional moments counterpointed by a low-down bass-driven thump thump during more laconic parts. Boy, this solitude can certainly be a bit rough! As I mentioned, I’m hard pressed to thoroughly critique this film without major spoilers, so let’s just say that this film comes with my highest possible recommendation for anybody who enjoys a good quality film. Moon is a stunning debut feature from Jones, and as I write this, I’m salivating at the thought of digging into his sophomore effort, Source Code. Moon is a very, very good film. Katz Korner: Who Are the Actors You’d Watch in Anything? Rockwell is great in this role and I could really feel some great tension and mystery in this film's atmosphere, which really made it work. Hopefully Duncan Jones can keep things going after this year's Source Code. Good review my dude. Thanks Dan, I think Jones has a very bright future if Moon and SOurce Code are anything to go by. He's done well by me so far! I loved this movies, I totally went in blind and did not know anything of the special plot. Great work!! Thanks Scott, glad to hear you liked it as well! Great film, the moonscapes were amazing considering the small budget and Rockwell was incredible really. Great write-up! Strike one up for another fan of Moon! Thanks for dropping in, Duncan! This is one of my all time favourite films. I remember when it came out and there were three things that got me interested: sci-fi, Duncan Jones and Sam Rockwell. Together they are a fantastic combination and it really is an intelligent, thought-provoking film. Claire – I agree with you, Moon is indeed an intelligent film, and most assuredly one which provokes a lot of thought . I'm not sure it'd be on my all time "favourite" list, but it's definitely on my "best of the last 5 years" list – Moon doesn't lend itself to a high number of re-watches, so in that regard I couldn't class it as a favorite. Thanks for stopping by with a thought or two! I did not love Source Code, but I did think the best part of the whole film was Jones' directing. Moon, however, I REALLY loved! 9/10 from me as well, and nice write up! Thanks Matt…. wow, you didn't enjoy Source Code? Man, I thought that was a reasonably decent (if somewhat belaboured) effort from Jones, even if therre were a few issues with it. Moon is awesome and the warm response it got gave me a lot of hope that true science fiction in film could have a resurgence. Then Jones did Source Code and it was clear he loved real sci-fi as much as I did. And he's a good director. A total win for me, I can't wait to see what he comes out with next. There are only two things about Moon I didn't like, the opening is a little too similar to 2001 for me and the ending is kinda weak, but despite that, I loved it. Funny you should mention the opening of Moon, Will, because my wife (who was half-watching over my shoulder at the time) said pretty much the same thing! Oh well, if you're gonna pinch a film opening, I guess something from Kubrick is as good as any other choice! Moon kind of freaked me out with it's twists and turns, but it's such a well done Sci-fi film. Source Code isn't quite as good, but still fun. Glad you enjoyed it. Thanks for stopping by Max! Man I am ashamed to say I haven't seen this yet, but I was so impressed w/ Source Code that I drafted Duncan Jones for my 3rd fantasy movie (for Castor's blog). I will see this soon since you rated this so high, Rodney. Great review!